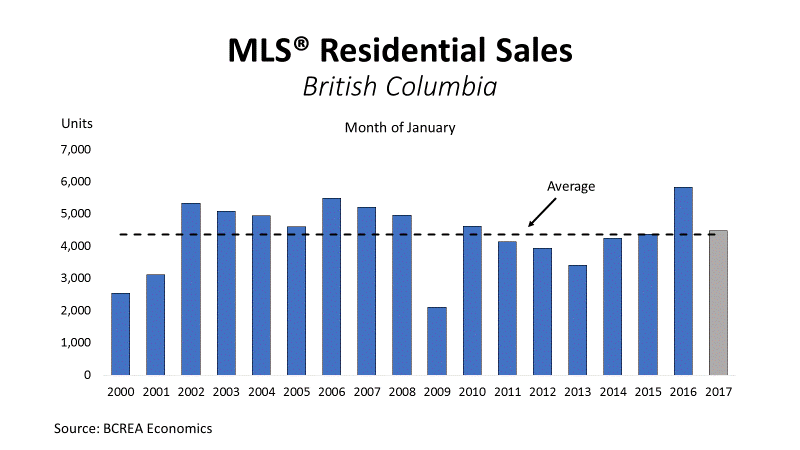 Vancouver, BC The British Columbia Real Estate Association (BCREA) reports that a total of 6,580 residential unit sales were recorded by the Multiple Listing Service® (MLS®) in February, down 31.7 per cent from the same period last year. Total sales dollar volume was $4.53 billion, down 39.7 per cent from February 2016. The average MLS® residential price in the province was $688,117, an 11.7 per cent decrease from the same period last year. The average MLS® residential price for the province was down nearly 12 per cent from a record $779,419 in February 2016. However, this change is largely the result of a decline in the proportion of provincial sales originating from the Vancouver region. 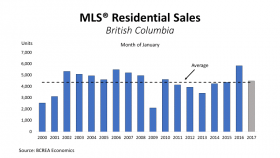 Last month, 37 per cent of BC home sales occurred in the Real Estate Board of Greater Vancouver’s area, compared to 44 per cent in February 2016. BCREA is the professional association for more than 20,000 REALTORS® in BC, focusing on provincial issues that impact real estate. Working with the provinces 11 real estate boards, BCREA provides continuing professional education, advocacy, economic research and standard forms to help REALTORS® provide value for their clients.